They say the best things come in the smallest packages. That is certainly the case with the KV-S1037 Series compact scanners. Both models feature a compact body that can fit into confined, narrow spaces. Meaning you save space without compromising on performance. Alongside impressively compact dimensions, the KV-S1037 Series scanners deliver performance to match anything in the class. Alongside an auto-document feeder (ADF) capacity of 50 sheets, the two models scan at up to 30ppm/60ipm @300dpi in colour, giving you the same speeds for both binary and colour documents. The KV-S1037 Series scanners are designed to meet the rigorous demands of life in your industry. Both have a daily duty of up to 3,000 pages per day and a roller replacement cycle of 100,000 pages. For additional reliability, a double feed prevention roller system means fewer scanning delays, and faster, smoother scanning operations. The KV-S1037 Series scanners couldn’t be easier to operate, thanks to single-touch scanning. You simply press one of the three preset buttons to scan and send the data to defined destinations. You don’t even need to touch the scanner to operate these devices. 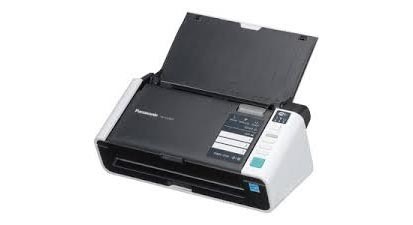 For convenient manual paper scanning, you just insert your document directly into the ADF to start the scan. With these compact scanners, you can eliminate the possibility of problematic scan settings. An integrated auto preview function automatically adjusts whatever is scanned, offering nine possible ‘candidate’ types. You can then select the most suitable image with a single click, making any further adjustments that might be required. So there’s no need to waste time going through a trial-and-error process and highly legible electronic documents are produced, quickly and easily. Also, to save you time and effort, an auto rescan feature allows the user to adjust the image on a PC screen without rescanning the original document.